Wonderful, Wonder Craft...hey it's Wonder Hill! 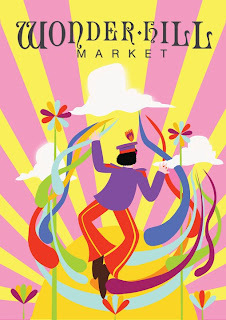 Our lovely friends at Wonder Hill Market are on the hunt for quality stall holders for a couple of their summer fairs. In order to apply for a stall you must be a designer maker or a purveyor of tip top Vintage goods. This summer they'll be touching down in London Bridge in a prime location to catch and capture those tourists! Oh yes it's going to be a Craftolympics with tons of gold medal type stuff!!! You see, by buying hand made...everyone wins! The last one out turns off the light! It's with great sadness that we announce the closure of our little shop in Wood Street Indoor Market. From the end of July we'll be packing up and moving on to what we hope will be greener pastures. After 6 months of trading we've come to the conclusion that it's just not the right location for us! We've had fun, met tons of really nice people, made some new friends and managed to introduce a few new consumers to hand made shopping by selling the fabulous designer maker goods we've had on offer! Feed back in the majority has been positive so Craft Guerrilla know that this type of shop is something we'll want to do again.... heck we WILL do it again!!! That's a promise. I'm still in love with the idea of being a "shop keeper" of all things hand made so if all goes to plan we'll be back very soon! Having a studio, retail shop and a "Craft-Tea Shop" with sewing machine hire, serving home baked cake and lashings of tea is something we will relaunch in a brighter, bigger space... plus having a bigger shop area would be lovely too as we have so many talented makers and were always pressed for space in Wood Street! Fingers crossed we'll pop up soon in a another place with better foot fall and better location. In the meantime we'll still be operating as usual hosting our monthly DIY Craft Nights, Crafternoons and working with museums, galleries, hosting other crafty events and private parties! It basically means we're back to basics and doing what we were before having the shop so we're still around. Thank you all for your support and for all your kind words, it wasn't easy but we think all in all this is the best decision we can make at present. We close for good on Friday the 27th of July. It's not a surprise that IKEA are the leader in home wares & furniture as it's also no secret that I have a long standing love affair with the Scandi flat pack giants! So in my never ending quest to find the perfect shower curtain I headed off to the large blue and yellow box off the A12. Yes I do have a thing about shower curtains and take finding the "perfect one" very seriously! Usually I have no problem in finding things I like and easily deviate from my carefully written list...oh yes, you know what I'm talking about! No list means coming away with boxes of tea lights, arms full of photo frames and trollies filled with that stuff you sigh and mutter about at the check out with "I don't really need this but...." statements but still place them on the conveyor belt! After many years of buying at IKEA and always finding the "perfect" shower curtain I was disillusioned with their current choices. Bland, functional and very austere... and just because we're in the age of austerity it doesn't mean I want a grey, plain, boring shower curtain in my bathroom Ikea designers!!! It is after all the first thing most of see in the morning!!! 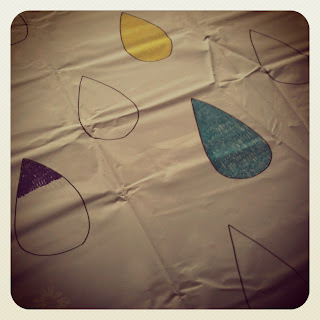 So I picked up a plain white £3.99 plastic "Eggegrund" curtain with the intention of adding something of my own onto it. step 1: Lay out your curtain onto a large table and wipe the curtain with some hot soapy water to remove any grease or dust. Leave to dry. step 2: Choose a design. I opted to draw it first on paper and I'm glad I did so. I had an idea where I was going with it though I did slightly change the composition. With a soft nib pencil draw your design onto the curtain. this is what you need: Shower curtain (plain white) a design, a pencil and some permanent markers! step 3: When you're ready and happy with your design use a permanent market and trace your drawing. I used Sharpies* though others are available. I got mine form Amazon and they were a really good price for a pack of 12!!! I also chose to use a simple black outline for my design because I think it adds extra Kawaii cuteness to it. step 4: colour in your design... I used simple vertical strokes for the look I was after... but it's up to you what you do! 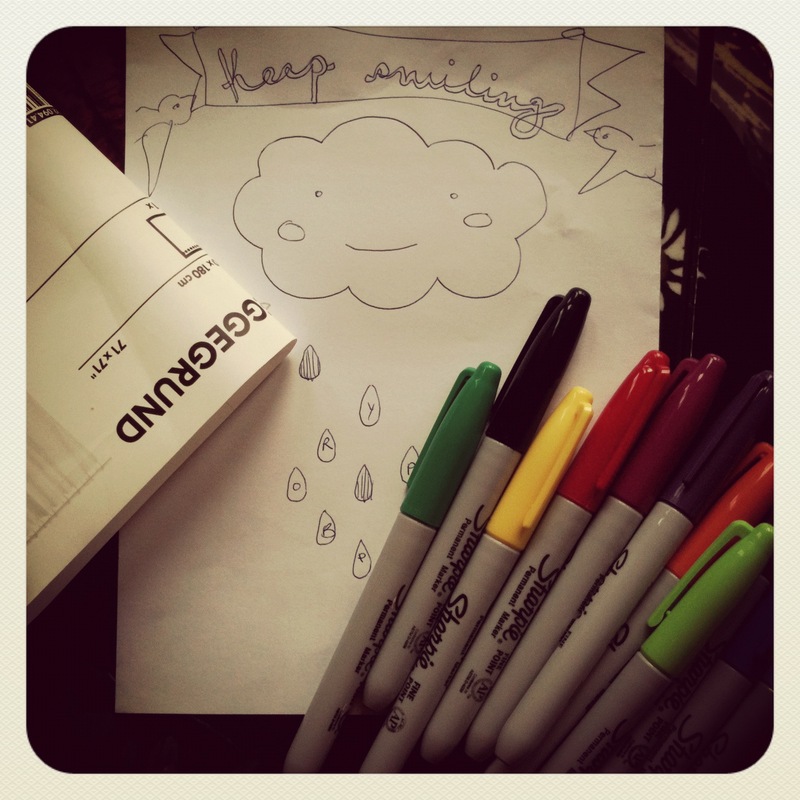 I also left a few "rain drops" plain IE without colouring them in. step 5: That's it. 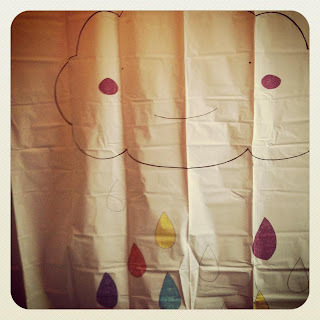 Hang it on your shower rail and enjoy a happy shower in the morning!!! Hope you enjoy making your own and please do share your photos of your creations! 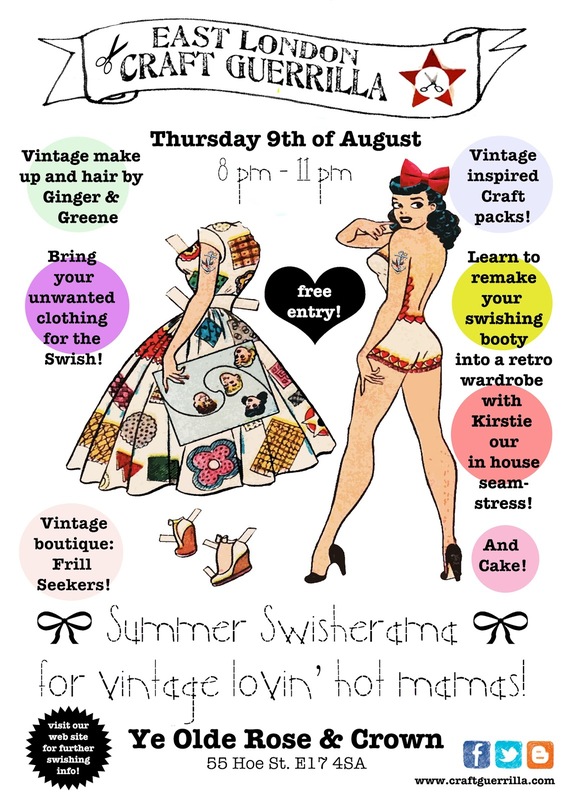 Summer Swisherama for vintage lovin mamas!!! After a hectic year we thought we'd take July off and return in August to the Rose & Crown pub with a brand spanking new format for our DIY Craft nights! Still based on the "Make Do & Mend" ethos, up cycling, recycling and self sufficiency but with a bit more added glamour! Also we'll be in the back of the pub in the Red Room and pool table area because we think a change of scenery is just what we need. We'll still host mini monthly workshops with a guest tutor as well as introduce a few little extras like Swishing! Yup, you've heard right, this is your chance to remodel your wardrobe and get rid of any unwanted frocks, separates, shoes etc in exchange for another pretty item of clothing! It's a great way to recycle your wears plus we'll have Kirstie from "just can't help it" retro boutique showing you how to hem, alter and transform your new treasures to fit into your new retro loving wardrobe! BUT if you fancy the real deal the Frill Seekers Vintage boutique will be open as usual!!! So how does the Swish work? Everyone brings in unwanted clothing, handbags, hats, gloves, belts, accessories, etc. and shoes. They must be clean and in good condition. You will have 30 minutes to look through, try and drool over the items and at 8.45pm on the dot we'll blow the whistle so you can go through the rails and grab your chosen item. A small fee will be charged per item. The gorgeous and perfectly coiffed Ginger & Greene will also be on hand at their pop up Beautifying Station where the Vintage Beauty Train will roll up to remake you lovelies into glamorous starlets! No booking required but please ask the ladies for their coiffure/ Make up menu and pricing. This month we're making knickers made from recycled silk scarves! Sarah Kerry will be on hand to show you how to make a pair of pretty knick knocks. £30 per student though you must be proficient on a sewing machine. All materials provided. 6 spaces available. Pre booking required. More details including booking info to be announced. We're still offering ready to make craft packs but working on bringing you a new selection of glam projects! As usual we'll be on hand to help and guide you though for a small £3 fee you are welcome to bring your own projects. There will also be home baked cakes available to purchase...booze and cake? Well why not? !